Did you set goals this year? Commit to New Year’s resolutions? Set intentions? Whatever you called them, now that it’s February, are you still on target to achieving them or did you fall off the wagon? 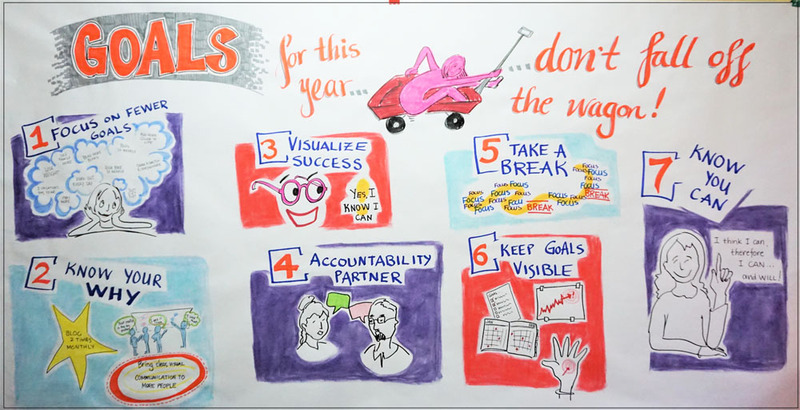 Here is a graphic recording example illustrating seven tips to keep focused on reaching your goals as the year moves on. Focus on one or two goals and know WHY they are important to you. If you find yourself falling off the wagon, refocus on your WHY. Visualize succeeding and achieving your objectives. Find an accountability partner and talk on a regular basis. Make commitments and hold each other to them. As the journey of your success moves forward, take a break every now and then. Take a deep breath, then regain focus and move ahead. Keep your goals visible by checking off your progress, tracking them in a calendar or journal, or graphing your journey. A visual reminder is a good motivator, especially if you are moving in the right direction. If you are moving in the wrong direction, use your visual reminder as an awareness tool. Refocus on your WHY. Move forward again. Lastly, think you can and know you can achieve your goals. With the correct mindset and strong focus, you will achieve your goals! Make your own good luck! If you need help getting your team to remember specific goals, consider creating a graphic recording map to help keep their goals visible. This graphic recording example is one of many. Contact me today to discuss your needs.